(1mar08)In this issue we'll tip over a Philsboat and see what happens. The 15 March issue will rerun the important essay on rigging a lugsail. If you build a Michalak design expect many comments from bewildered observers! Younger people by and large scoff, asking me "what kind of boat is THAT! ", while I have found older people to be more understanding. One gentleman asked me what it cost to build. I replied NZD4000 including trailer. He wandered away scratching his head. 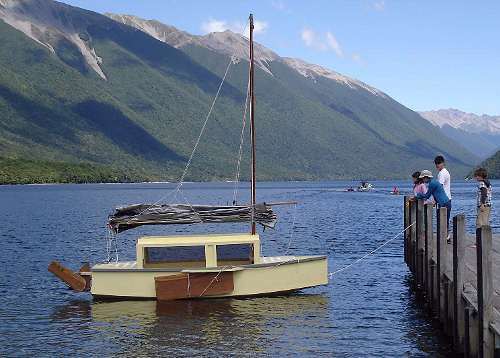 He had just spent NZD5000 on an outboard motor! Unbelievably, I met somebody who recognised the design. "Isn’t that a Michalak?" he said "Pencilbox, Musicbox or Jewelbox?" 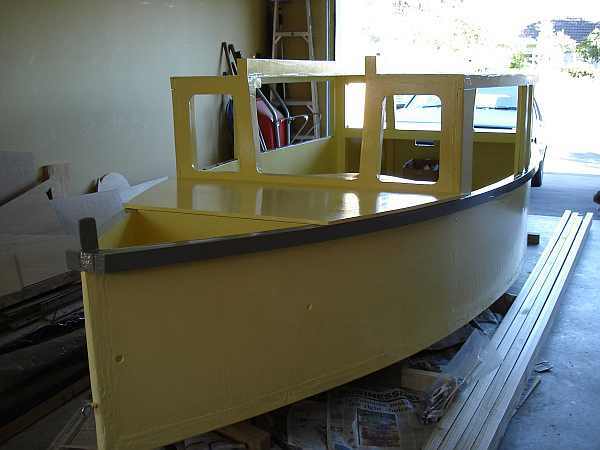 "Philsboat", I replied, "A newer design." "Does it live up to its claims?" he asked. "As far as I can tell" I replied "although it is early days yet." So how does it go? First from a safety aspect, the Birdwatcher cabin is brilliant. My children are in no danger of falling out, the cabin prevents them getting chilled and because they are removed from the elements they are less likely to get frightened from splashing water in gusty conditions. I did a capsize test in a calm lake and I believe based on that, that Philsboat is self righting from a knockdown. Without any one inside it went negative from 70 degrees. However with someone inside it stayed positive all the way to 90 degrees and self righted very quickly. Held down at 90 degrees with an occupant inside there was still 14 inches of freeboard to the cabin slot, but as soon as the mast was released up she came. Today, I went out in 25 knot winds and rough conditions on Lyttelton Harbour with an experienced sailing friend. We broached surfing downwind on a large swell in a gust and had a full capsize on the leeboard side. My lake test had been on the other side. The boat lay stable on its side, but once we both got our backs against the floor it self righted without any water being taken on board. He was impressed with that. Neither of us have been in a full capsize of a sailing boat before. From capsize to upright again probably took 15 seconds. Not an experience I would like to repeat in the near future! We felt that to prevent this again both occupants should sit near the rear and on the opposite side to the winged out sail, which when going downwind should be winged out over the leeboard, rather than opposing it. The rest of the trip felt much safer once we did that and reefed down a bit more. The offset mast vs starboard leeboard and rudder geometry works fine in all conditions. The boat is well balanced. Beating into 25 knot winds at 50 degrees and rough water, the tiller was very light to the touch. Periodically some water would splash through the forward slot opening, but we stayed relatively dry and took on the couple of keelers that were out reefed down. Of course they beat us hollow, but the point was that we were out in conditions that most open boats would not be comfortable in. It’s important to remember to keep the leeboard down when motoring. I was concerned that the rudder’s turning angle was too small and on it’s maiden voyage (no sail for that, just 2HP Yamaha outboard) my fears seemed to be justified. Then I tried lowering the leeboard and suddenly we could turn on a six pence! 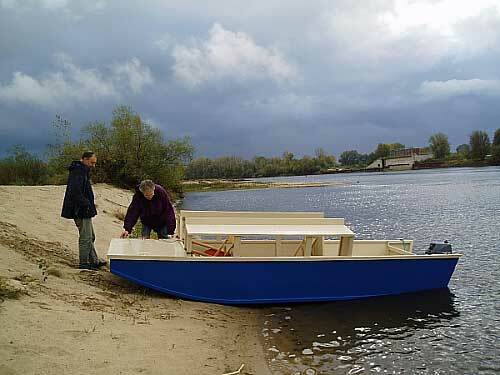 Actually, Philsboat isn’t super manoeuvrable, but with the leeboard down its turning circle is good enough. Windage is a problem when under motor. If I got the boat broadside to the wind, it was impossible to bring it into the wind under motor. The only solution was to go downwind, build up some speed and then turn. My friend commented that Philsboat seemed to be happier under sail than motoring and I agree, particularly in the strong conditions we were in. However, the 2HP outboard is just fine for moving about once you have some speed on. The motor well is too narrow and deep to steer with the outboard. Instead keep the outboard locked straight ahead and steer with the tiller. This seems to work well especially if travelling a long distance. Cabin gets pretty echoey though. I wonder whether foam glued to the cabin side of the motor well would deaden the noise? The motor well is just the right size to tilt the motor up when sailing. I found there was enough room to carry a 1 ¼ (5 litre) gallon can of fuel in the motor well without interfering with the motor in any way. It’s even possible to refuel mid trip although I wouldn’t like to try that in rough conditions. Even in calm conditions it was a bit of a balancing act over the transom! Windage under sail doesn’t figure. As long as you have speed on Philsboat goes over from tack to tack smoothly. The hull design means that nearly all the lateral resistance comes from the leeboard, a little from the rudder and virtually none from the hull, so that leeboard is critical for Philsboat’s performance. If it isn’t vertical all lateral resistance disappears. On the other hand, since it’s shape is highly efficient like a daggerboard, I have found that Philsboat’s pointing ability is pretty good. Somewhere between 45 to 50 degrees depending on wind velocity. With the enclosed Birdwatcher cabin it is easy to get over-confident about Philsboat’s capabilities. While it does a brilliant job of preventing you getting wet in a capsize, the windage it generates can seriously compromise your handling ability when you have no speed on, just the time when you need it most at launch and docking. The offset geometry has no effect on Philsboat’s performance and the ease of use advantages are a major plus for the design. 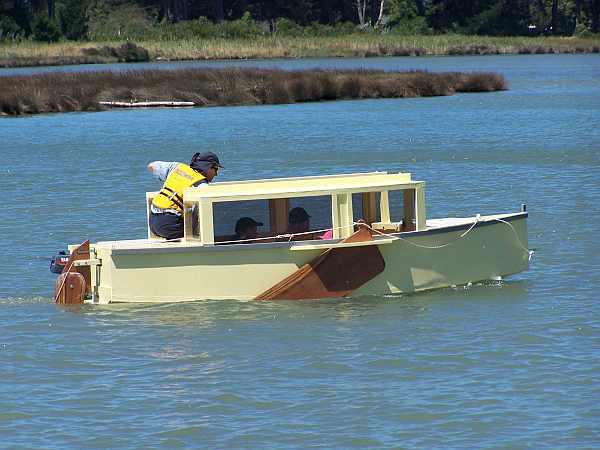 Philsboat’s flat hull and deep high aspect leeboard result in a fast boat with good pointing ability and as a protected waters enclosed dinghy, Jim’s Philsboat is a clever, serendipitous design, but I would not consider it as an open water cruiser. You are much too reliant on that leeboard. If it should fail, you’re a high windage sitting duck! ... Actually no. I can see how you thought that after re-reading my report, but I had already worked out previously that the sail should be over the leeboard going downwind. That was just general information I included for others contemplating these offset geometry designs. There was no death roll and Philsboat never felt like it was going into one of those. What actually happened was that we were on port tack running downwind when my friend got up to do something forward. At the same time a big wave came through, the boat began to surf, dug in and spun around in a classic broach. It all happened in slow motion and I knew there was absolutely nothing I could do about it! Apparently the look on my face was a study - of complete terror no doubt mixed in with despair that all my hard work was about to get destroyed on the rocks to leeward! The sail was in the water and my friend started to get out through the front slot to stand on the leeboard as you would in a traditional dinghy capsize, but I had retained enough of my senses to call him back and say "if we both put our backs against the floor it should right itself". Blessed relief when I saw the sail lifting itself out of the water and I knew we were going to come up OK. Once we were upright (as the boat righted itself it pointed into the wind) we checked to see if we had taken on any water and there was none to be seen. I don't plan to capsize again, but if I did, there is no need to panic. The boat lies quietly on its side with it's hollow mast, spar and battens preventing a capsize beyond 90 degrees and there is 14 inches of freeboard to the slot, so there is no immediate danger. Ever since I've built my Philsboat, I've been testing out what it can and can't do. In my original report I said that it is not designed for open sea work, but the thought kept nagging away at me, "how can you say that when YOU haven't personally experienced a Philsboat in the ocean?" Yesterday, I took my family and their grandfather out for a beautiful sail in our local estuary in benign 10 knot conditions. Everybody enjoyed themselves although a 2 hour outing was probably overdoing it for my young daughters. 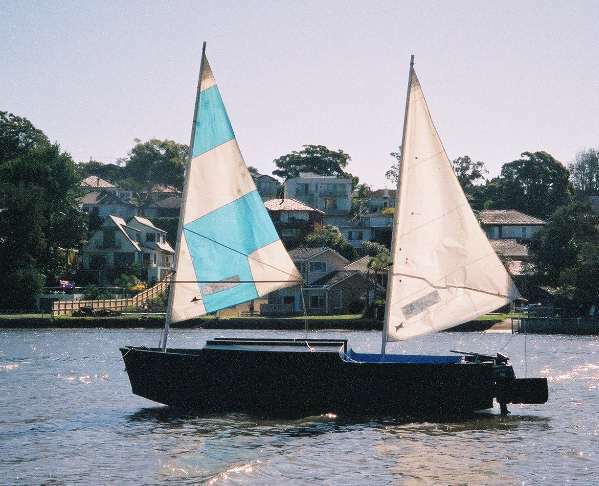 With three adults and two children aboard, my Philsboat was well ballasted and went through its stays majestically with its 4 inch lowered rudder. 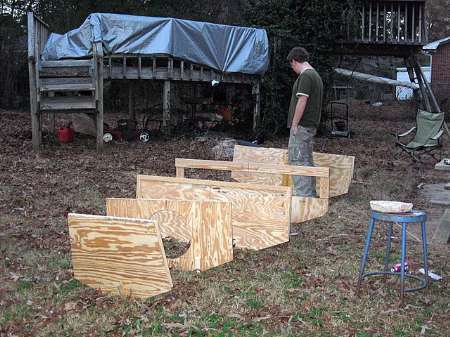 It also hardly heeled with its reduced 104 sq. ft. sail. Reaching back home after tacking to the top mark (as I've noticed before in light conditions my junk rig points poorly - 65 degrees perhaps) we hit a sandbar. I lifted the leeboard right up and the weighted rudder took care of itself sticking out at a 45 degree angle. We continued to scoot along in about a foot of water with no detectable leeway. Great stuff! We even had so much momentum I was able to round up to a mark we were going to undershoot. On the way home I noticed a dinghy sailing offshore in our local bay. "Hmmm", I thought," if he can sail a dinghy out there, why can't I? Anyway, its time to conquer my fear about going solo in rougher water. " Turns out, I discovered this afternoon, he dismasted not long after I saw him fully rigged, 300 metres from the beach, triggering a full scale rescue effort involving our lifeboat rescue service and the police! This morning, the forecast said 10 knots going 20 knots in the afternoon with swell ½ metre or less. That sounded good to me. Down to the slipway where some fishermen gave me plenty of encouragement to get out there. Somebody else hanging about, I suspect now, was a lifeboat crew member waiting to see if another rescue would be needed! Immediately after launch the swell seemed more like 1 metre to me! The 2hp outboard handled it all fine, but the pounding was something else. Some swells were really waves on the verge of breaking and my Philsboat felt more like a bucking bronco than a sailing boat. After I had cleared the breakwater by 200 metres things calmed down a bit and I thought I better get this thing sailing. That's when I found that the sheetlets on my junk sail were tangled. By the time I had untangled them and reattached the mainsheet, I was beginning to feel sea sick. Finally, I got the sail ¾ reefed just to be on the safe side and began sailing. Most of the pitching stopped and Philsboat punched its way along into the wind happily enough although the pounding continued unabated. Surprisingly, I found that I didn't need to constantly monitor the mainsheet to prevent a capsize. Philsboat was quite stable with only my weight as ballast and we made good progress to about 2 kms offshore. However, when I came to tack across from starboard to port Philsboat just couldn't do it. I don't blame Philsboat though. I just wasn't heavy enough in 10 knot winds and a lumpy ¾ metre swell to provide enough momentum to get through the wind. I reefed down for security and gybed across. By now I was feeling decidedly sea sick and turned for home. Philsboat behaved beautifully on the port reach home. A couple of times I ended up broadside to a larger swell, but just turned and slid down it. 200 metres away from shore the fishermen waved to me cheerily as they charged past in their 150hp aluminium fishing boat. I waved back even though I had had enough of being pummelled into submission for the last hour. I reefed down and started up the 2hp outboard. The rest of the trip was uneventful. I have found that as long as I make my recovery approaches from upwind, I can drift in very quietly with the motor on idle for the last 20 metres. Would I take Philsboat out into the open sea again? No! It's too light. I haven't attempted a motion comfort calculation, but I already know the answer will be a shocker. 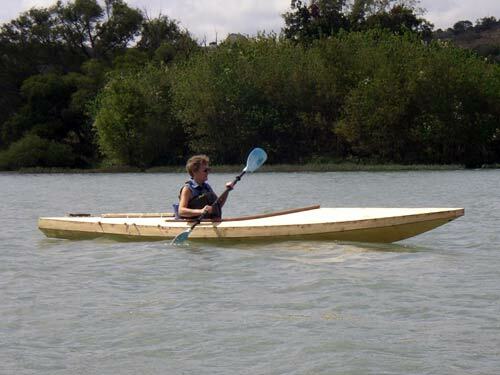 Unlike Phil Bolger's Micro or Matt Layden's Paradox, Jim Michalak's Philsboat is a light non-ballasted dinghy in disguise with its ¾ length cabin. While my choice of a junk rig makes a big difference to my confidence in adverse conditions, in the end Philsboat is just too light for rough water and being sea sick really takes the shine off the experience too! Prototype plans for Blobster are $30. This is Ted Arkey's Jukebox2 down in Sydney. Has a temporary rig and he is working on the blueprint rig. And the Vole in New York is Garth Batista's of www.breakawaybooks.com, printer of my book and Max's book and many other fine sports books. 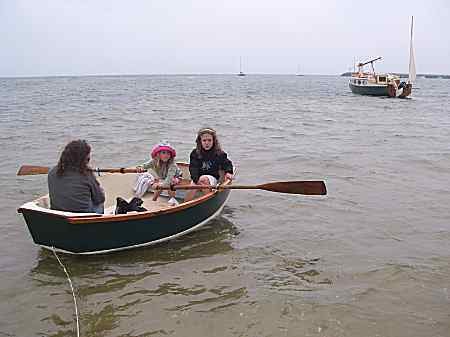 Boat is done, shown here off Cape Cod with mothership Cormorant in background, Garth's girls are one year older. Beautiful job! I think Garth is using a small lug rig for sail, not the sharpie sprit sail shown on the plans, so I will continue to carry the design as a prototype boat. And the Leinweber's make another prototype! 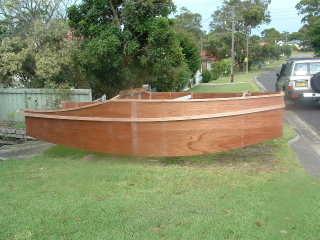 This one by Sandra, an Imresboat shown here on its first outing. They are taking it on a "cruise" so more about it later.